Sophisticated, virtuoso and multi-faceted, whether in a full-length concert or as part of a line-up at a special event, the Berliner Cellharmoniker represents classic chamber music and classy entertainment at its highest level…. The Berliner Cellharmoniker was founded in 1994 and quickly established itself in the international music scene. The quartet won the Charles Hennen International Chamber Music Competition at Heerlen in the Netherlands, the Special Prize at the International Cello Ensemble Competition at Beauvais, France, the “Dancing Angel” Trophy of the European Union of Music Competitions for Youth and the European Youth Ensemble Prize from the European Foundation for Culture. 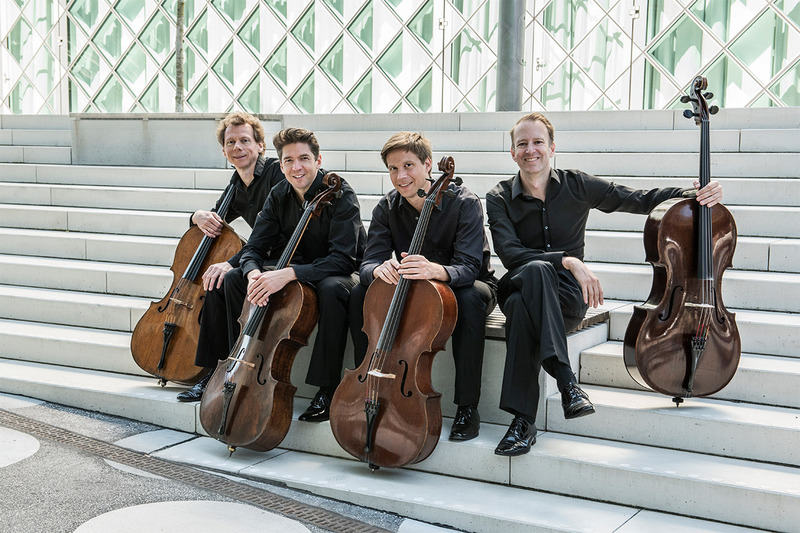 Performing at prestigious venues and major festivals throughout Germany such as the Rheingau or the Schleswig-Holstein Music Festivals, the quartet quickly convinced audiences and critics alike of its unique qualities. Still, the unusual combination of four cellos gives the ensemble its own distinctive style that defies easy classification. The wide repertoire of the Berliner Cellharmoniker encompasses all periods and styles from early baroque to modern pop. The quartet presents original arrangements of film scores, German Schlager, pop and jazz as well as classical and contemporary compositions for four cellos. Some pieces were also written especially for the quartet by various composers. All four players are graduates of Berlin’s two music academies, where they studied with Michael Sanderling and Wolfgang Boettcher. The musicians are prizewinners at numerous competitions and festivals, both national and international. They also perform regularly as soloists, with other chamber music ensembles and as either members or regular guest-musicians with such renowned orchestras as the Konzerthausorchester Berlin, Berlin Rundfunk Symphony Orchestra and the Berliner Philharmoniker.